I encountered my first computer when I was in the 8th grade. I was living in Reno, Nevada, and had a friend who’s dad ran a couple of 7/11 stores with the help of a TRS-80 and some software he’d written. The program’s listing was printed out on tractor feed paper and was completely incomprehensible to me. I also saw the “Dancing Demon” application. The listing for it was even more crazy since it made extensive use of string packing, where machine language was encoded into BASIC string statements. I was hooked and had to know more about this “personal computer” thing where you could write your own games and such. 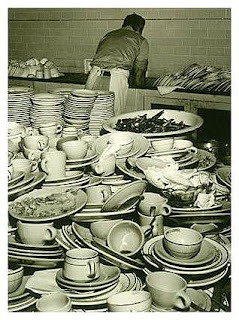 Enter my summer job washing dishes at Dodson’s Cafeteria, circa 1979. I worked full time and saved my money. At the end of the summer, my step-dad took me to Radio Shack and kicked in the last hundred dollars or so for my very own TRS-80 Model I Level II, a 16K black and white computer with a cassette tape drive for storage. I also got a subscription to SoftSide magazine, a monthly publication with program listings n BASIC for the TRS-80. I typed in the listings and, with the help of the computer’s reference manual, debugged the programs and got them running. Thus I began to learn how to program. In 1980, at the age of 14, I was hunched over a keyboard in the attic office space of our home in Dallas, writing a silly Enterprise vs. Klingons game, with a big blocky Enterprise on the left and a Klingon warbird on the right. Each player used a pair of keys to move their ship up and down the screen, and another key to fire upon their opponent. I knew little about realtime action programming at the time, so all movement ceased during a firing. It wasn’t the funnest of games to play, but it was my first real program, created entirely from scratch.